I want to show you my “Schnitzel and Boo Mini Quilt Swap” quilt that I sent out in the mail last week. If you think you are my partner and don’t want to see it (I am in Briawna’s group) then look away now! If you haven’t heard of the “Schnitzel and Boo” swap it’s a huge swap on Instagram that is just wrapping up now. I has 950 participants and is hosted by Kristi of the blog “Schnitzel and Boo”. She really wanted Heather Ross’ Mendocino in her quilt so I have that in the centre square and also in the centres of the spinning star blocks. (I think of them a ninja stars.) I used Cotton + Steel basics for the stars. I asked my husband how he thought I should quilt it and he said with bubbles. I traced some cups and bowls with a water soluble fabric pen to do the quilting. The binding is also a Cotton + Steel Basics fabric. This mini is 24″ x 24″. I ordered some fabric from Heather Ross’ Spoonflower shop too and made a zipper pouch. It’s lined with the octopus Mendocino fabric. It’s stuffed with fat 16ths and scraps of Mendocino that I didn’t use for this project. I also decorated a tea towel with a band of Mendocino and printed some Mendocino note paper which I can’t show you because it is peronalized with my partner’s name. I am proud of this project and I really love how the Cotton + Steel works with the Mendocino! I can’t wait to see what she thinks of it. Did you see my post from last Wednesday of the WIPs on my ironing board? I said I really was hoping to get them finished. Well, of course, I didn’t get them all finished but here’s what I got done. I sewed two flying geese blocks for my bee that I’m in over on Flickr. I am now in two bees. This one is called “We Bee With It”. There are six of us and we make two blocks a month for six months. February is my month. Whoo-hoo! Tha looks really great! I used a scrap of Mendocino on a keyring as an extra in my parcel too. I love your hedgehog! It is adorable. Your mini is gorgeous, and the rest of the projects are looking good, too! Those bubbles are such a compliment to the design, Anita. Such a pretty mini and cute pouch. Your partner is going to be so pleased! 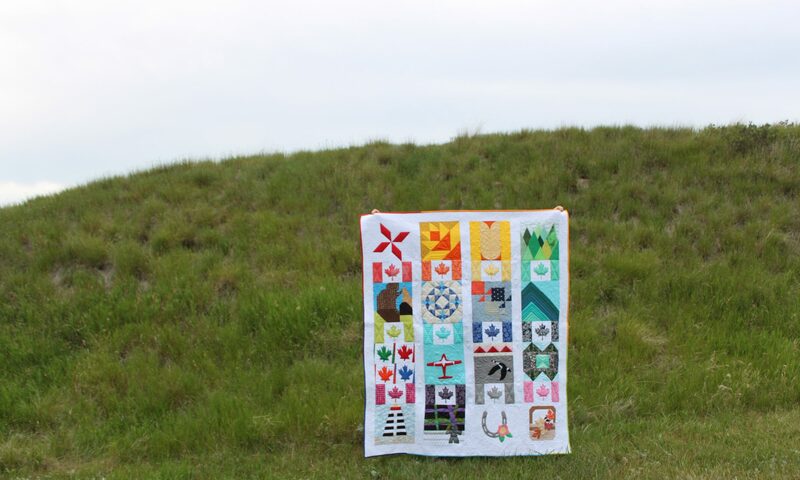 Love those Flying Geese blocks, too! Such great projects! Your mini is lovely, and the hedgehog is so fun! I have to say I can't believe your partner specified such specific (and difficult!) fabrics she wanted like in her mini (though it was nice of you – and lucky for her- that you could and did oblige!). Love your Hazel on the Collage background! I have a heap of that I stashed away for a one day background; I really need to find a project to use it! Love the design & the fabric,and the quilting really really adds to it. Those blocks!!!!!!!!!!!!!!! Be still my heart!! I'm psyched to see what else you're making for your bees and swaps. This schnitzel and boo is a real stunner!! And that bag!!!!!!! drooling!! These are great! I love your mini quilt. I may have to do some ninja stars like that. I'm on an hst and flying geese kick lately. They're so versatile. Also, Your Hazel is so cute! I was tempted to buy that pattern. I think her glasses will finish her off nicely. lovely blocks, and awesome mini! How generous of you to use some Mendocino! You have one lucky partner! Thanks for linking up to Building Blocks Tuesday! It's gorgeous and I love the quilting you did on it!